These Salmon & Corn Cakes are done in under 15 minutes and use canned salmon! Serve them as a meal or make into smaller cakes for a fancy appetizer. I suggest that you only use skinless and boneless canned salmon. 1. In a mixing bowl, combine salmon, corn salsa, egg and bread crumbs. 2. Form the mixture into 4 cakes. 3. Heat olive oil in a skillet and saute the salmon cakes for about 4 minutes on each side. 4. 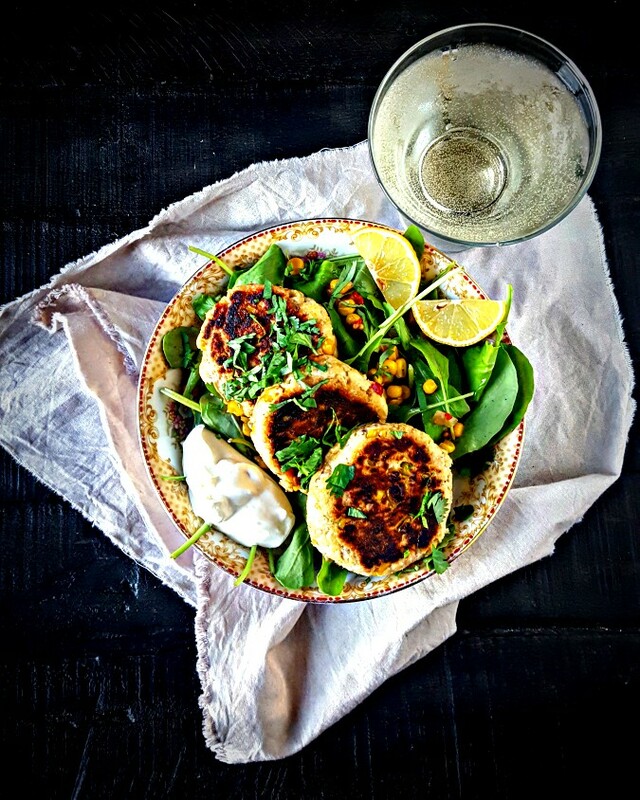 Serve the cakes on a bed of arugula topped with more corn salsa, cilantro, labneh, and a few slices of lemon. Easy. Good for you. Can be served hot or at room temperature. This makes a great Friday night dinner or a weekend lunch.